"To the left of the train is the forest fire lookout tower. Towers like these were used atop mountains and high elevations. Forest service employees would live in these towers during fire season. You are welcome to climb to the top and enjoy the view." You have likely heard this speech many times while riding the train at the BCFDC. Forest fire lookout towers were valuable in protecting the trees that were to be logged from the raging fires that were sparked by lighting storms, and more frequently, human caused fires. In the 1900's towers gained popularity and were widely used across Canada, but most frequently in British Columbia. With today's advances in technology we now use satellite imagery, planes and high tech cameras to spot forest fires far earlier than the human eye can detect. 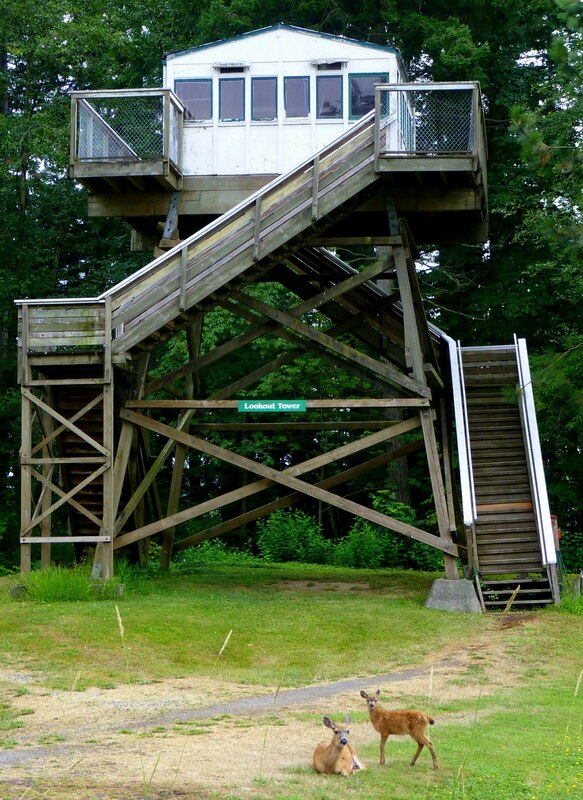 This has led to the disuse of fores fire lookout towers. The tower at the BCFDC is a reconstruction of the original and follows the same design. Rangers would live in the tower with their camp cot and small kitchen. An outhouse would be located nearby on the ground. Rangers would live alone for many weeks before the next ranger came to take the next shift. Feel free to climb the NEWLY PAINTED(!) lookout tower on your next visit and have a look around our site from your new-found perch! We would like to extend many thanks to the Thunderbird Forest Fire Fighting Crew from Port Alberni who came down and helped us out for three days. 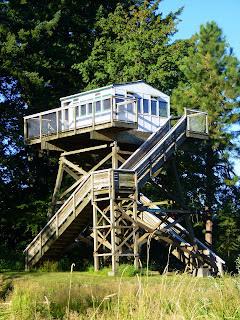 They painted the lookout tower and ranger station and even removed a problem stump for us!